Review: Dina Demille runs a quaint bed and breakfast in a small town in Texas. Dina is magically tied to her inn and the only guest is a retired Galactic woman who can't leave the grounds because she's a mass murder. 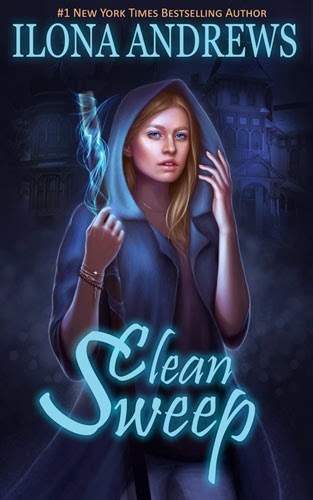 As an innkeeper, Dina is supposed to be neutral to all things supernatural, but when dogs start being killed in her neighborhood by something sinister, she gets involved. She asks new neighbor (and werewolf) Sean Evans for his help as well. Anyone who follows my reviews knows I'm a huge Kate Daniels fan (and The Edge series) so I was super excited to start this book, the first in a new series. I was not disappointed. The writing team of Ilona and Gordon Andrews excel at world building, creating likable heroines and adding humor to a story. I like Dina's unique magic and a world that has vampires, werewolves and aliens. There is so much potential for the series, I can't wait for the next book. I also like the relationship progression between Sean and Dina. Also unusual-this book contains drawings of the characters, something I've never seen before.